Nick Kyrgios is just 19 years old. He isn’t ranked in the top 140. As of a week ago, he’d won just one match this year above tennis’ minor leagues. He didn’t earn his way into Wimbledon, but instead got in with a freebie, a wildcard. And of course, the No. 1 player hadn’t lost in a major to anyone outside the top 100 in 22 years. 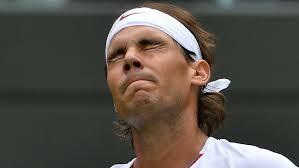 So people are seeing Rafael Nadal’s 7-6(7-5), 5-7, 7-6 (7-5), 6-3 loss to Kyrgios Tuesday as a historic upset. But here’s the truth: If you’re stunned that that kid was able to beat Nadal, then you just haven’t been paying attention. The much more stunning thing would be if Roger Federer beat Nadal. Luckily, thanks to my inner-Uncle Toni, I’m here with the checklist of Nadal’s problems. Some are fixable, some have to be worked around. The list includes Nadal’s knees, his grips, his positioning and his brain. Other than that, he’s still good to go. Nadal’s game has been tailored perfectly, thanks to Uncle Toni Nadal, Rafa’s uncle/coach and Mr. Fixit, to beat Federer. Nadal pumped up his serve some and hit wicked forehand topspin to Federer’s weakness, his high backhand. He has dominated Federer ever since. When Novak Djokovic bypassed Nadal, Uncle Toni had him step up close to the baseline to cut off Djoker’s wicked angles. Up close, Nadal wouldn’t have as much time, so he had to shorten his backswing and start driving through his backhand. That also would cut down on the excessive running on his creaky knees. The great thing about Nadal is his willingness and ability to adjust and adapt. The problem is that he has adjusted and adapted to Federer, Djokovic and Andy Murray. Those guys don’t crush the ball. And here come some young, tall crushers — guys like Kyrgios — who have the confidence to play one-strike tennis against Nadal. He has lost to guys ranked 100 or lower on the fast grass at Wimbledon three years in a row. He is going to have to adjust again. No way should he have allowed Kyrgios to hit 37 aces against him. Nadal was too reluctant to step back on his return Tuesday to have more time to read Kyrgios’ serve. He wouldn’t guess. He was frozen. Another problem is his extreme grips, which don’t leave him much time to adjust to which side the serve is coming. Nadal has been the biggest mystery on tour all year. We always seem to be waiting for The Big One with his knees, when they’ll finally blow up. As a result, every single setback sets off signals that this might be it. But Nadal has definitely lost a step. And as a result, he’s having some trouble getting into perfect position for his forehand and those extreme grips. At the Australian, his body broke in the middle of the finals. His back went out. At the French, he was too scared to hit his forehand early in the tournament, and was jumping and floating them. When opponents attacked his forehand, it was clear to Nadal that he had to swing away, even though he had no confidence in that. So he swung away, and the ball went in. Nadal’s confidence grew. And he won the title. At Wimbledon, he kept losing the first set to nobodies, and struggling to win. The book is out on him now: Swing away, crush the ball. Attack. That’s what Kyrgios did. It’s not what Federer, Djokovic or Murray do. The pounding on Nadal’s knees over the years led to the lost step, which led to the problems on his forehand, which led to the overall loss of confidence. Uncle Toni’s new fix is going to have to involve returning serve from different spots depending on who Nadal is playing, and also adjusting his grips on the return. There will be plenty more, but it’s actually easier to tailor a game to stop an individual or two, even if it’s someone among the greatest players ever, than it is to adjust to the rest of the tour. Nadal lamented that these young players are swinging away so freely. Kyrgios said he was annoyed and motivated when he read an inteview with a woman saying Nadal was too good for him. The woman quoted as saying that? Kyrgios believed. Before the match he said publicly he thought he could win. So that’s a new problem for Uncle Toni’s checklist. The list keeps getting longer and the obstacles higher. Eventually that will catch up with Nadal. As long as he’s still beating some of the greatest players of all time, it’s probably OK not to panic. When he starts losing to Federer, look out. At this point, I still have faith Uncle Toni. This entry was posted on Wednesday, July 2nd, 2014 at 8:28 am	and posted in Nick Kyrgios, Rafael Nadal, Roger Federer, Uncategorized, Wimbledon. You can follow any responses to this entry through the RSS 2.0 feed. I agree partly. I think this thesis holds good more on Wimbledon than US Open. We’ll see, maybe Kyrgios will find a way to make his high risk approach work on hard courts as well but he hasn’t adjusted well so far to the North American hard courts. But the days when Wimbledon and US Open were closely matched in pace are gone and besides, even now the ball doesn’t get up anywhere near as high on grass as it does on modern hard courts. Anyhow, this year Nadal isn’t even playing so it doesn’t matter. But last year he had a phenomenal hard court season post Wimbledon and adapted very well, playing some of the most attacking tennis I’ve seen from him. For some reason, he hasn’t been able to do that on grass.